The Spice & Tea Exchange in Downtown Owa weaves a rich tapestry of sights and smells. OWA, the new 520-acre resort in Foley, has opened its admission-free dining, shopping and entertainment district called Downtown OWA, and among its newest stores is a treasure trove of exotic scents and spices. The Spice & Tea Exchange is a specialty retail store with an extensive selection of spices from around the world, according to Greg Rawls, OWA’s director of business development. “The Spice & Tea Exchange is an experience-based store,” says co-owner Anna Heim. Customers can open jars to catch the scent and watch the firm’s experts create hand-mixed blends. 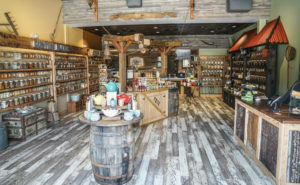 The shop has more than 140 spices, more than 85 hand-mixed seasoning blends, 17 naturally-flavored sugars, 25 salts from around the world and more than 45 exotic teas. The Spice & Tea Exchange also offers recipes and accessories to complement the spice and tea selections. Peter and Tammy Heim, and their daughters, Anna and Jensen, also have Spice and Tea Exchanges in New Orleans and Galveston.